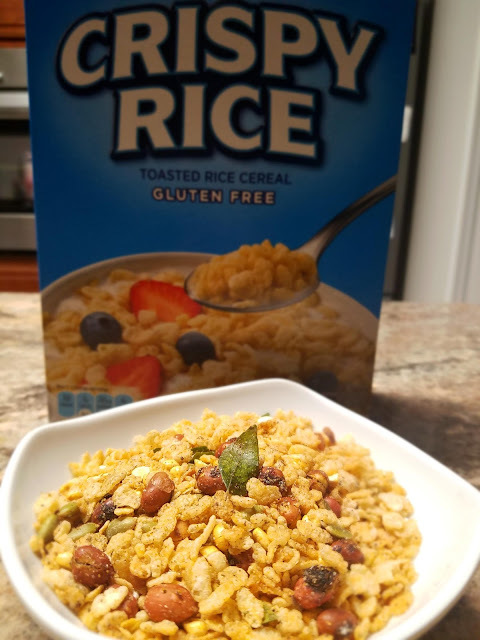 As a home chef who holds the cuisine of India as a personal favorite, I consider it to be quite an honor to be invited by Jahnavi to write this guest post. I'm a big fan of her blog and the recipes which she and her mother create. Let me begin by stating that I am an American and have never traveled to India. However, I have long held a keen interest in the food and culture of the sub-continent. As a young man, I was first introduced to Indian cuisine by the kindness of a friend's family and several excellent restaurants in the Washington D.C. area. I was quite intrigued by the complexity of flavors and soon, I began experimenting with my own Indian inspired dishes. Thus began my twenty year journey into learning to prepare dishes from different areas of India, and to be as close to authentic as I know how to do. At a recent trip to an Indian grocer, I was interested in the big beautiful Bottle Gourds, which were for sale. I asked the lady operating the store how I might prepare the gourd, and specifically asked if it would go well in sambhar. 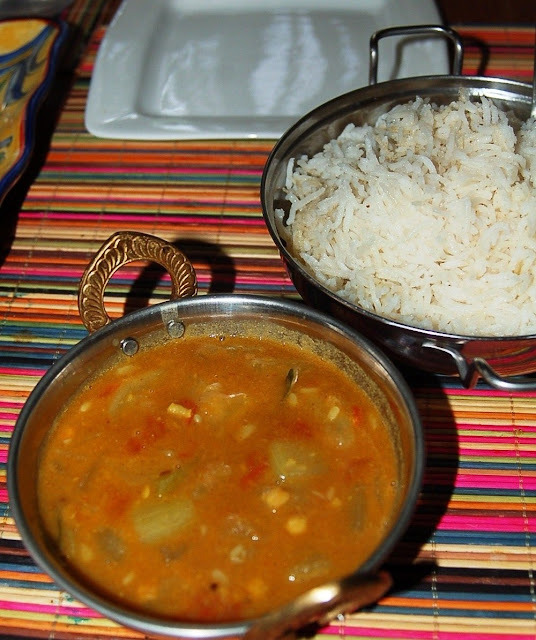 She explained that this is known in parts of India as Dudhi, and it would indeed work well in sambhar. 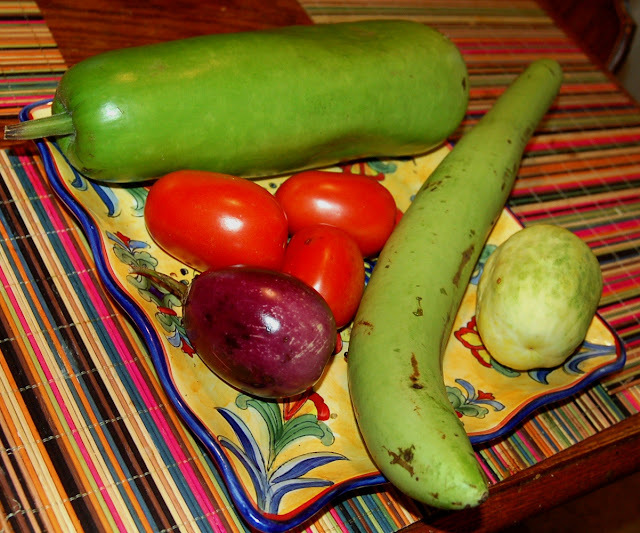 I bought two dudhi and the store keeper threw in a nice aborigine (eggplant) and Wax Gourd. Here's the recipe for Dudhi Sambhar that I prepared for my family recently. 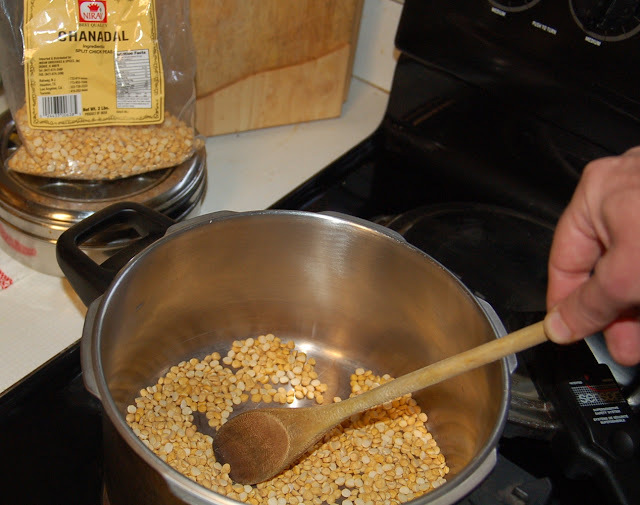 We begin preparing the sambhar by lightly toasting the chana dal until fragrant. 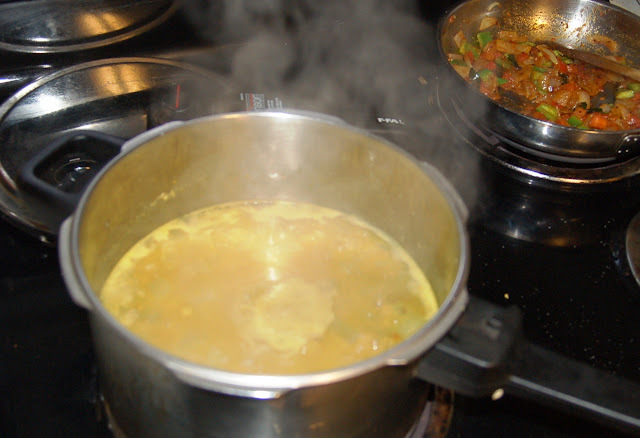 In a pressure cooker, add the lightly toasted dal, 3 cups of water, salt, turmeric and asafetida. Bring to pressure and after 10 minutes, remove pressure cooker from heat and allow pressure to drop before opening the lid. Then mash well. Peel dudhi and wax gourd and chop them into 1" cubes. Add them to the dal along with 1 cup of water. Place closed pressure cooker back on medium heat and bring to pressure. Once it reaches 10 lbs pressure, remove from heat and allow pressure to reduce. Meanwhile, roughly chop the onion and capsicum. In a separate pan, heat the two tablespoons of butter. Toss in cumin, mustard seeds and curry leaves. Add onion and fry at medium heat until the mixture begins to turn golden brown. Add capsicum and stir for one minute. Then add chopped tomato, Sambhar powder, and salt. Fry this mixture for several minutes until tomatoes have become pasty and oil begins to separate from the vegetables. Stir a small portion of the dal mixture into the onions and then return that to the dal. Soak dry tamarind in some lukewarm water for ten minutes and strain this into the dal. Allow the dish to simmer for 10 more minutes to allow the raw tamarind taste to cook out. Heat one tablespoon of butter in a pan. Add the fresh curry leaves and fry for 30 seconds. 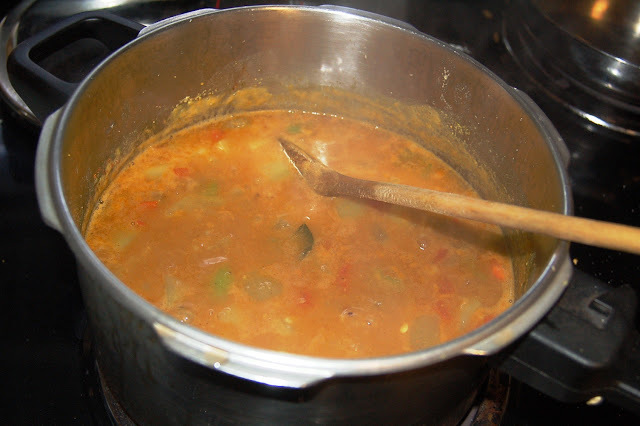 Drizzle the butter over the sambhar. Serve with Basmatic rice and chappati.